What can be said about Waylon Jennings that hasn't been said before? Leader of the outlaw country movement, he paved the way for Willie Nelson and Kris Kristofferson to achieve star status as they followed Jennings' lead, helping to make the outlaw country movement go down in history as one of the most important country movements of all time. 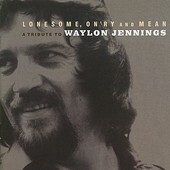 So it no surprise that everyone from Henry Rollins, John Doe, and multi-platinum jazz artist Norah Jones, through Guy Clark, Dave Alvin, Junior Brown, and Alejandro Escovedo come together and pay homage and remembrance to the late, great country legend that is Waylon Jennings. Rollins turns "Lonesome, On'ry and Mean" into a hard rock exploration, while Jones' "Wurlizter Prize (I Don't Want To Get Over You)" is a classy, brandy sippin', late night smoky jazz number. Doe's rendition of "Only Daddy That'll Walk The Line" does right by Jennings, too. Allison Moorer's "Storms Never Last" is one of the stand out tracks, amongst standouts, on the album. Her beautifully rich voice soars, bringing new life to the Jennings' classic. Other cuts by artists such as Alejandro Escovedo ("Lock, Stock, and Teardrops"), Kris Kristofferson ("I Do Believe"), and The Crickets ("Waymore's Blues") prove that Jennings touched many artists and helped influence them and shape their sound, either directly or indirectly. A fitting tribute to a monumental musician; I'll give it an A.